Joe Konte « Author, "The Rivalry Heard 'Round the World"
Author, "The Rivalry Heard 'Round the World"
The Giants caught a break when Barack Obama knocked off John McCain and Mitt Romney. While the two Republicans are fine fellows, Sports-Fan-In-Chief Obama simply made a better host than his challengers would have when the championship Giants teams visited the White House in 2011, 2013 and 2015. This brings up the big question for 2017: If the Giants follow their even-year trend, who would be the best man/woman to celebrate their 2016 title at the White House? INAUGURAL BALL: I have taken an unscientific poll (aren’t they all?) and determined that based on my findings, it does look like Trump has a good shot at winning it all. This is based on the ABV Index, which stands for Autographed Baseball Value. Now I’ll admit that I was surprised that not only are there signed baseballs from the candidates available on eBay and other Internet sites, but that their value mirrored the status of the political races. Trump’s ball led the field at $999. The Cruz-Rubio values were very conservative, of course, with the Cruz ball going for $200 and Rubio’s for $199. I couldn’t track down whether the fact that Cruz got his ball to be worth a dollar more than Rubio’s was a dirty trick. A Jeb Bush ball signed while he was governor was listed at $508, but as his candidacy plummeted, so did his ABV as a ball signed during his campaign dropped to $421. Ben Carson also had a ball valued at $421, and poor John Kasich was barely in the picture with a ball worth $87.95. Clinton held a slight advantage over Sanders, out-pricing his souvenir $799 to $689. Interestingly, Hillary wants one person to write a check for the ball, but Sanders insists that 10 small contributors pool their money and share the value. What is interesting is that when Bill Clinton’s autograph is added to Hillary’s ball, the worth rises to $1,799. So Bernie, don’t underestimate Bill’s impact in this election. None of the candidates can compete so far with the ABV Index of Obama, who has a ball priced at $4,274. George W. Bush is a distant second, at $2,499. WORSE THAN THE DH: The MLB should celebrate the 20th year of interleague play by dumping it. The expansion to two wild-card teams means that clubs in each league are battling for five postseason spots. This year, for example, the Giants are expected to compete fiercely for those berths with the non-NL West Cubs, Nationals, Mets, Pirates and Cardinals. Yet, the Giants only play them seven times each. Instead of adding another series for each of those teams, setting up some great August-September dramatic matchups, the Giants play 20 games against American League teams they are not contending against. This is a more difficult argument to make this year because many Giants fans are excited about a home and away series against Boston, and a three-game series at Yankee Stadium. However, these marquee matchups are not the norm — who out there has marked their calendar for the Giants-Tampa Bay showdown? The June 7 game against Boston will likely be the hottest ticket of the season (Giants already are pricing this one high) because Red Sox Nation shows up no matter what the venue, and also because it should mark Pablo Sandoval’s return to AT&T Park. I hesitate on the latter reason after seeing the spring training photo that revealed that Pablo has been spending more time behind a plate than a catcher does. If he plays that night, Giants fans must greet him with a standing ovation. Let him be the Panda again for two nights — he deserves that for his great moments and good times he provided for the Giants. SKIP THE OPENER: The home opener is always special, but this year, the third home game is the most attractive. The Giants make their 2016 AT&T debut against the Dodgers on April 7. There is no title to celebrate, no championship flag to raise, so the fans will have to make do with the traditional team introductions, fly-overs and ceremonial pitches. Just two days later, the way it shapes up now, Madison Bumgarner will duel Clayton Kershaw. Gentlemen, start your rivalry! SHORTSTOP SQUARE OFF: An article on MLB.com evaluated the fantasy value of the Giants vs. Dodgers position by position, including rotation, closer, and setup men. The Giants edged the Dodgers 6-5 with three ties in the 14 categories. The eye opener was at shortstop, where the writer favored Dodgers rookie Corey Seager over the Giants Brandon Crawford. Seager appears to be the undisputed top prospect in baseball, hitting .293 in the minors with 18 homers, and .batting .337 in 27 games in the big leagues in 2015. Crawford hit .256 with 21 homers and 84 RBIs in 2016. He has played a minimum 143 games each in the last four years, and has a Gold Glove, an All-Star berth and two rings. Seager appears ticketed for Cooperstown already, but for 2016, I’d put Crawford ahead of Seager on my fantasy team. Regardless, watching both perform this year should be a good sidebar to the rivalry. DUCK AND COVER: MLB is looking at having netting installed from dugout to dugout at ballparks to protect fans near the field from line drives and bats or pieces of broken bats. The No. 1 fan of such a move is new Giants centerfielder Denard Span. Span, leading off for the Twins in an exhibition game against the Yankees in 2010, hit a screaming shot into the stands by the first base dugout. The ball slammed into the chest of his mother, who was wearing a Denard Span jersey with his name on it. Span dashed to the stands as soon as he realized what happened. Fortunately, his mother was not seriously hurt, and after being checked, remained for the rest of the game. Span said at the time that netting needed to be placed along the lower seats to prevent a tragedy. MONUMENTAL DECISION: Gaylord Perry was a great Giant, and everybody loves him. The workhorse hurler was 134-109 with a 2.96 ERA. He played with seven other teams and had 314 career wins. Yet, it was surprising when the Giants announced they would honor Perry with a statue at AT&T. There are four statues now — Mays, McCovey, Marichal and Cepeda. Those monuments are baseball’s equivalent of Mount Rushmore, which has existed quite well over time as a national symbol without adding on another president. And if a fifth statue is necessary, how is it not Barry Bonds? AT&T is the house that Barry built. Sure there is that nasty problem about Bonds cheating, but isn’t Perry legendary for juicing the baseball? Well, maybe later Barry. For now we can look forward to celebrating Perry’s statue when it is unveiled in August. I hear the artist has done a great job capturing Perry’s features. In fact, some might call it a spitting image. In 1985, Jim Davenport was asked to rebuild the Titanic from the remaining pieces on the ocean floor. That’s pretty much the task he faced when the Giants tapped their former third baseman to manage the 1985 club. The Giants were 66-96 in 1984, the most losses by a Giants team since 1943, and the owner Bob Lurie was trying to sell the team. Davenport, a Giants coach, got the unenviable task of trying to right the ship, and as if to tie an anchor around him, the team traded away its biggest star Jack Clark. This sorrowful 1985 club went on to lose 100 games, and Davenport was replaced in a late-season shake-up, as Roger Craig took over as manager and Al Rosen as general manager. The new regime got some new weapons, and was able to improve the team. But Davenport’s year at the helm should always be respected, for he truly was asked to take one for the unsettled franchise, and he did so with honor. I provide the above context of Davenport’s one managerial year for newer Giants fans, who might just remember him as an old former ballplayer whose team lost 100 games. That is especially important today upon hearing the news that Davenport had died at the age of 82. Davenport made his rookie debut on April 15, 1958, in the opening West Coast game between the Giants and Dodgers. He quickly established himself as a Dodger-killer. He drove in the first ever San Francisco Giants run with a sacrifice fly to deep right field in the third inning off Dodger star Don Drysdale. His single during a four-run fourth knocked Drysdale out of the game as the Giants went on to an 8-0 win. The Dodgers won the next day, but Davenport’s four hits propelled the Giants to a 7-4 victory in game three to take their first series against their rivals. His two home runs Aug. 30 helped the Giants to a doubleheader sweep of the Dodgers. In that inaugural season, he batted .429 against the Dodgers. In the 1962 playoff against the Dodgers, his bases-walked in the deciding game three brought in what would be the winning score as the Giants won the pennant. Davenport never lost the competitive spirit in his post-playing days. While coaching third base for the Giants in 1978, he squared off against the Dodgers’ Reggie Smith as a beef between the teams escalated, forcing umpire Nick Colosi to step between the would-be combatants. Davenport’s offensive ability — .297, 14 homers, 58 RBIs — in the pennant winning year of 1962 often got overlooked because of his sparkling defense that earned him the title of “The kid with the golden glove.” Davenport played his entire 13-year career with the Giants, hitting .258 with 77 homers and 456 RBIs. Davenport did it all, and there is no better example of that than what he did on June 11, 1966, at Candlestick Park. The rivalry went to a new level as Davenport went up against Dodgers’ pitcher Jim Brewer in a pre-game cow-milking contest between the teams. The cows were brought on to the field behind home plate, and Davenport demonstrated that he was also “The kid with the golden hands” as he outmilked Brewer to give the Giants the win. As good as that story was, my wife and I have always had a good laugh about her meeting Davenport in 1959 as a little girl. Davenport was at a local store on a goodwill tour for the Giants, and my wife’s grandfather brought her to see him. When her turn came to meet him, her grandfather urged her to ask a question. The best she could do was to ask, “What’s two plus two?” The good-natured Davenport smiled. My wife and I have laughed about this encounter just about every time we’ve heard his name mentioned over the years. We thought about it today when we heard the news of his passing. This time, the laughter had to compete with tears. Since 2010, the Giants have a regular season record of 520-452. The Dodgers are 526-445 during that span, 6.5 games better than their rivals. Yet, the Giants hold a 3-0 ring advantage. Why is that? Deep analysis is not needed. For the answer, we need to only review two plays that define why the Giants have soared while the Dodgers have stumbled in the postseason. One of the plays was the stealth steal of third base by the Mets’ Daniel Murphy during the fourth inning of Thursday’s NL Division-deciding fifth game against the Dodgers. Murphy was on first base, with left-handed hitting Lucas Duda at the plate facing Zack Greinke, and the Dodgers leading 2-1. The Dodgers applied the shift defense, leaving only shortstop Corey Seager on the left side of the infield. When Duda walked, Murphy trotted to second. The alert Murphy saw that the non-attentive Dodgers hadn’t shifted back to have someone cover third, so he breezed into the bag without a throw. He then scored the key tying run on a sacrifice fly to right by Travis ‘Arnaud. 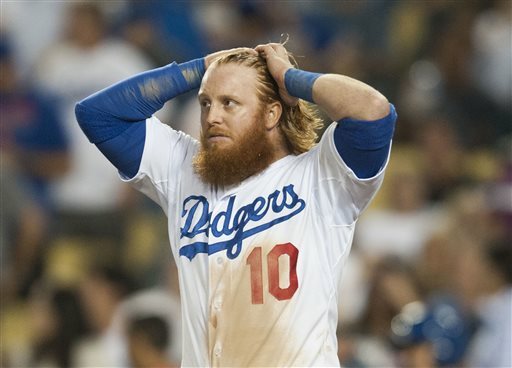 The Mets went on to a 3-2 win to advance to the NL Championship Series, and the absent-minded Dodgers ended up looking like part of an Abbott and Costello skit (who’s on third?). I put the blame on Dodgers manager Don Mattingly. The once-rare shifts have become common defensive strategy, but there is a risk because the players are out of their familiar positions. In this case, as soon as Duda walked, there should have been an automatic re-shift where Seager would break to third base. This isn’t on the rookie Seager. Mattingly should have this already drilled into his team so the positioning was natural. If nothing else, the Dodgers’ blunder has created a new sabermetric category, RAWS (Runs Allowed While Sleeping). In Game 2 of the 2012 World Series between the Tigers and Giants, Detroit’s Prince Fielder was on first base in a scoreless game in the second inning when Delmon Young slashed a line drive off Madison Bumgarner down the left field line. While left fielder Gregor Blanco tried to track down the ball as it careened around in the corner, third base coach Gene Lamont waved Fielder around third. Blanco’s throw sailed over the head of shortstop Brandon Crawford, who was the cutoff man. At that moment it appeared the Tigers would take a 1-0 lead. However, second baseman Marco Scutaro had hustled all the way over to the third base line just in case, and was in position to grab the errant throw, wheel, and fire the ball to catcher Buster Posey as the 275-pound Fielder neared home. Posey made a classic catch and sweeping tag in one motion and Fielder was out. It was Detroit’s only scoring threat and the Giants won 2-0 on their way to a sweep. While there are obviously other factors that affect postseason success and failure, those two plays speak a lot about focus, preparation and a baseball second sense to react to sudden developments on the field. The Utley slide: If every baserunner slid into second base like the Dodgers’ Chase Utley did against Mets’ shortstop Ruben Tejada, we’d be out of shortstops after the first couple weeks of the season. Tejada suffered a broken leg when Utley ignored the base and crashed into his lower body in an attempt to break up a double play. This is not just about hard slides being part of the game. If Utley smashed into someone walking down the street in that manner, he’d be doing hard time. Baseball has looked the other way at legislating the danger around second base, so you have this gray area of “neighborhood plays” where a fielder doesn’t even have to touch the bag for a force, and no boundaries on how far a runner can go to prevent the infielder from throwing to first. Giants fans should be sensitive to this after the Cardinals’ hulking Matt Holliday tried to send second baseman Marco Scutaro to an early grave with his barrel-roll attack in the 2012 National League Championship Series. A ruling that says a slide needs to be started before reaching the base would be a good start. Despite those feelings, I felt MLB executive Joe Torre was out of line in suspending Utley for two games. Taking out the infielder has been part of the game for 150 years. The player who does so is welcomed back to the dugout with high-fives and respect. So making Utley the sudden poster boy for baserunner bad boys wasn’t fair. Instead, Torre could have issued a warning that such activity would be subject to suspensions from that point on through the postseason. Even if his authority to do so would be in question until safety rules were agreed to by the players union, his threat might be sufficient to keep the MLB out of the ICU. Catcher in the Why: Toronto catcher Russell Martin must have been wondering “why me” after his routine throw back to the pitcher in Game 5 deflected off the bat of the Rangers’ Shin-Soo Choo, and rolled away, allowing Rougned Odor to score from third. No one could ever remember this happening, but on further review, baseball should have seen this coming. Before the new rule this year that keeps players in the batter’s box, hitters used to practically wander to another zip code in between pitches while adjusting batting gloves, uniforms and other things. So catchers could toss the ball back with no one there. In this case, Choo stayed in the box, stretched his arms over the plate and Martin let the ball go. Baseball is going to have to look at this: Could you imagine the winning run scoring in the ninth inning of a World Series this way? Flipped out: Blue Jays slugger Jose Bautista caused a stir when he pulled off a three-fer after his booming, game-changing home run in Toronto’s AL Division winning Game 5 against Texas. Bautista posed to admire his work, stared at the pitcher and then tossed his bat like it was a javelin. This showboating is becoming part of the show, and it’s probably fair given the fact that that pitchers pump their fists after strikeouts and look skyward to thank God for taking time out of his busy schedule to help them whiff the Devil-worshipping batter. So I’m Ok with all of it, but I’m going to draw the line if a hitter takes a selfie while doing his home run trot. When the Giants first came out west in 1958, my Dad took me to San Francisco International Airport to greet the players as they got off their airplane following a road trip. The players, some carrying their own luggage, would actually walk right by the fans, separated by only a thin strand of rope. I would lean against the rope with other fans, and hope that some Giants would stop long enough to sign my baseball. Some did, some didn’t. When the last player had walked through, my Dad would check out the ball and we would examine it to see what signatures I got. I still have the ball today, and it’s still a treasure, not just because of the names, but because of the fun we had seeing the players up close. A number of players didn’t sign the ball, choosing to move quickly from the plane to their cars and go home. Me and my Dad never thought to hold it against them, and cheered just as hard for those whose names weren’t on my ball as those who stopped the next time I was at the ballpark. I was thinking about this experience the last couple days after reading a hit piece on beloved Giants catcher Buster Posey by a New York Times political reporter. Usually the NYT reserves such distaste in its pages for those committing high crimes and misdemeanors. So what impeachable offense was Posey being accused of? Don’t laugh. 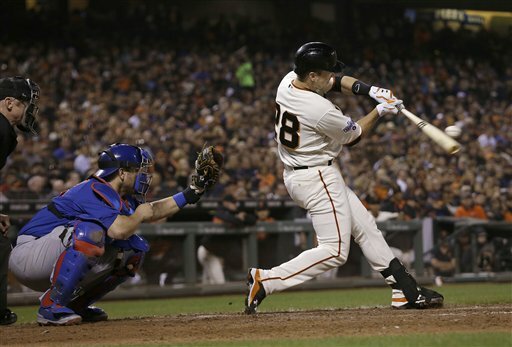 Posey had made the error of his career: He didn’t sign an autograph for the kid of NYT reporter Eric Lichtblau. Lichtblau has a Pulitzer and a couple of books, one on George W. Bush. Posey has three World Series rings. Fair fight, except Lichtblau has a lot of ink and a worldwide web page to publish his ramblings. So I feel obliged to step in and sort this out. How about a get-real conversation with Andrew that the ability to hit a ball, catch a pass or make a basket doesn’t make someone a hero. Instead of a baseball trip, take him to see volunteers who feed the homeless and comfort the sick, visit a fire station to meet firefighters who risk all to save life and property, or attend a Memorial Day service to honor those who have given everything. My understanding is that Posey works closely on community causes, but he doesn’t carry a sign around publicizing it. So maybe Andrew can learn that Posey really is a hero in matters that truly count. And assuming Andrew plays little league, there can be no better example of how to play and honor the game correctly. Posey plays hard, but respects the opposition, runs out homers with head down, and doesn’t go through a variety of gestures like his peers after simply getting a base hit. Lichtblau would be the last guy I’d want to go to a game with. Geez, he’s taking his kids to a bunch of ballgames, but the joy seems to be ruined by his downbeat attitude. He worries that the innocence of the game has been lost, and that his kids are jaded by the problems of the sport. Gee, I wonder where they got that from? But why pick on Posey, I asked myself. Then I checked his bio and discovered that Lichtblau worked for the Los Angeles Times for 15 years. So is this a case of an LA guy, a possible Dodger fan, passing judgment on a star Giant? Are you kidding me? Lichtblau seems so stressed — over baseball for gawd sakes — that I am willing to take pity on him. Whatever ails him, I recommend there is no better cure than a Buster Hug. The early morning clouds had given way to bright blue skies, providing a postcard day in San Francisco. It was a beautiful day for a ballgame. The date was March 12, 1999, and a baseball crowd was gathered, but there was no game that day. The occasion that drew me and the others to Washington Square Park in North Beach was the funeral of hometown hero and Yankees great Joe DiMaggio being held across the street at the historic Saints Peter and Paul Church. This was not a crowd of celebrity gawkers. This was the heart and soul of the city, native and longtime San Franciscans who were there to honor one of their own. But it was deeper than that. DiMaggio grew up on the sandlots of San Francisco, and his passing was a reminder of our youths where many a Saturday and Sunday and afternoons after school were spent on those sandlots playing this great game. Many of us followed in our fathers’ footsteps, for they played at some of the same sandlots, and then passed on the game to us. When driving through the city in recent times, I’ve passed some of the ballfields of my youth — Big Rec, Funston, McCoppin, Margaret Hayward and Sunset — and there weren’t any games going on. This is supposed to be a great baseball town. So, where are the baseball players? Why are the diamonds empty? These were the feelings many of us had as we watched the DiMaggio hearse arrive at the church, because he had represented the glory days of baseball in the city. We stood in respectful silence as the casket was taken inside and the doors were closed for the private service. When the doors opened about an hour later, the crowd went quiet again and stood at attention as the casket was taken back to the hearse. As the procession of cars began to pull away for the cemetery, we all spontaneously erupted in applause. It was DiMaggio’s final standing ovation. On Friday (August 7), I returned to Saints Peter and Paul to say farewell to another Yankee and another pride of the San Francisco sandlots. Rinaldo “Rugger” Ardizoia was the oldest living Yankee until his recent death at the age of 95. I felt a personal connection with Rugger though I never met him. He was two years behind my father at Commerce High School in San Francisco, and I’m told he looked up to him because my Dad was an all-city pitcher. When my Dad graduated, Rugger took over, threw a couple of no-hitters, and everyone including pro scouts started looking up at him. He joined the local Mission Reds of the Pacific Coast League, then moved to the Hollywood Stars, and in 1941 became part of the New York Yankees minor league system. He got his big league call-up in 1947, and on April 30, played in his one and only major league game, allowing two runs in two innings during a mop-up appearance in a blowout loss to the St. Louis Browns. Overall, Rugger won 123 games in 12 minor league seasons, and is still regarded today as one of the legends of the San Francisco sandlots. Rugger’s buddies have seconded that since his passing, showing their thanks for his friendship over the years and their final tribute to him at the church continues to move me. Marino Pieretti was another hotshot North Beach baseball star. He grew up in the area and pitched in the majors from 1945 through 1950. When he was stricken with cancer in 1977, his friends — many of them former Bay Area ballplayers — formed “The Friends of Marino Pieretti” to lift his spirits, and the group held regular meetings with Pieretti until his death in 1981. But the group continued as a way to honor him, and members were presented with green athletic jackets. They were all there on Friday, and as Rugger’s urn was carried from the church by his grandson, the green-jacketed members lined both sides of the aisle as a final tribute to their pal. I attended a reception afterward at the appropriately named Connecticut Yankee, a bar-restaurant filled with baseball memorabilia. The men in the green jackets were there, and they recalled stories of Rugger, DiMaggio and the sandlots of San Francisco. I soaked it all up, said my goodbyes to them, and walked out into a sun-drenched San Francisco afternoon. It was a beautiful day for a ballgame. 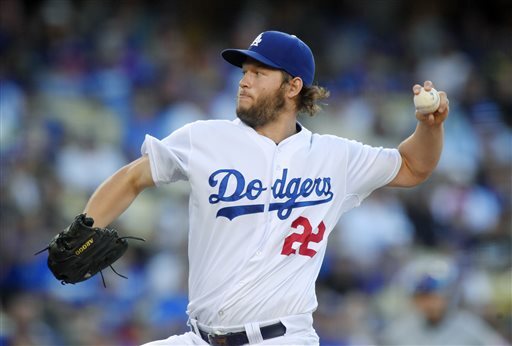 Dodgers’ ace Clayton Kershaw not in the All-Star Game? That’s like having the Inaugural Ball and not inviting the president. It’s like going to the Vatican to watch the pope celebrate high Mass at Christmas only to learn the pontiff has been replaced by a parish priest. Thirty-three of the 34 players have been selected for the 2015 game, and so far the only way the top pitcher in baseball can see the game is if he tunes in Fox. The players who have been flailing away at Kershaw’s electric repertoire of pitches for the last four dominating years didn’t find him worthy for one of their 16 selections. But here’s the real good part. Giants manager Bruce Bochy could have righted the wrong by selecting him with three pitching openings he had. But Bochy pretty much delivered a broadside to Dodger Blue. He chose instead his own Madison Bumgarner, certainly deserving after his historic 2014 post season; a 17-year veteran nearing the end of his career with just one winning season in the last five years; and a third-year pitcher with 19 career wins. Kershaw swept the MLB’s pitching Oscars last year with the MVP and Cy Young awards, yet on one of baseball’s biggest stage, Bochy was Ok with sending Sacheen Littlefeather to the mound instead of Marlon Brando. Call it the Snub Heard Round the World. What did Kershaw do to offend the baseball gods? Has he been caught betting on a game? Did he improve his velocity with steroids? Did he agree to be Donald Trump’s running mate? Kershaw still has one final shot at an All-Star berth as fans embark on an Internet-crazed vote the next couple of days, choosing from a list of five survivors. He should buy a fancy yacht with his millions, and sail away, leaving the other four waiting in this demeaning process to be voted off of the island. Here are Kershaw’s numbers starting in 2011, with wins-losses, ERA and strikeouts. 2011: 21-5, 2.28, 248. 2012: 14-9, 2.53, 229. 2013: 16-9, 1.83, 232. 2014: 21-3, 1.77, 239. That’s approaching Sandy Koufax territory, recalling the legendary lefthander’s remarkable four-year run from 1963-1966. This year, Kershaw is 5-6, 3.08, 147, although the win-loss record is skewed because of dismal run support. Still, he is on pace to strike out around 290, the most of any Dodger since Koufax in 1966. Beyond that, others have noted that Kershaw ranks solidly in the new wave of statistics that measure players’ performances by evaluating other factors beyond the traditional ones I listed above. What has happened to Kershaw is something baseball should address to make certain that the All-Star Game’s selection format doesn’t leave out, well, “stars.” In the 1960s era, for example, the game’s stars were pretty much assured of being selected, and then a few players were added who were having an exceptional season in that given year. So you could count on seeing Willie Mays, Hank Aaron, Roberto Clemente, Mickey Mantle and other greats. The big difference now is that voting by fans, players and the manager is based too much on who got hot from April to June of that season. With the expansion of rosters to 34, and usually a few replacements for injured players who can’t make it to the game, there is less of a chance that the star with a mediocre first three months would be left out. Baseball needs to establish the Willie Mays rule: Mays played in 24 consecutive All-Star games. He wasn’t always the stat leader in the first half of the season, but it wouldn’t be an All-Star Game without him. Perhaps the commissioner’s office should have one or two special selections just to make sure its showcase game doesn’t leave out the show’s best. MLB should at least be motivated to act on this if for no other reason than ratings, since that is the lifeblood of the gazillion-dollar TV contracts. With that in mind, why isn’t Alex Rodriguez on the American League roster? AL manager Ned Yost of the Royals said he didn’t pick the controversial Yankee because he needed more “flexibility” in his lineup and Rodriguez was just a DH. Flexibility? You’ve got 34 players! And Yost also reminds that the winner of this game gives their league champion home-field advantage in the World Series. Like that helped you out last year Ned. We all agree that Rodriguez has made a mess of his and baseball’s reputation, but the guy still has star power as well as 670 home runs. Let’s suppose it’s the top of the ninth in Cincinnati, NL leading 3-2, two on, two out, and Reds’ menacing closer Aroldis Chapman on the hill waiting to gun down the final batter with his frightening 100-mph heat. Look over the AL reserve roster. Do you really see anyone who would make this a magic, riveting moment? Thought not. Well, how about if Yost had the flexibility to pinch-hit Arod? MLB likes to call it the Mid-Summer Classic, and while that’s usually a stretch, that faceoff truly would be an All-Star classic. My experience in watching the All-Star Game over the years is that the buildup is almost always much better than the game, and that barring some very unusual moment, everyone forgets about it quickly and turns their focus back to the second half of the season. I’ve been to two All-Star Games and they were dry. The NL won 3-1 at chilly Candlestick Park in 1984 in a game marred by 21 strikeouts. The other was in Oakland in 1987 won by the NL 2-0. I attended the Home Run Derby at AT&T Park in San Francisco in 2007, which was probably the most boring time I ever had at a ballpark. However, I’ll never forget an impromptu, unofficial home run derby that suddenly broke out during batting practice featuring Reggie Jackson and Eddie Murray at the 1984 game. I was sitting in the front row of the right-field stands as the pair of AL sluggers ripped shot after shot at us. Fans started yelling “Incoming”! after each rocket blast. A fan next to me had the unfortunate experience of trying to catch one with his bare hand. I can still hear the splat, and I do believe the commissioner’s signature is still embedded in his palm. June never looked so good. This is the month the Giants are supposed to swoon, yet they are in a pitched battle with the Dodgers for the division lead. The Warriors haven’t had a chance to swoon in June for 40 years, but here they are in the NBA Finals for the first time since the 1975 season. I like the Bay Area in June, how about you? The A’s, you ask … well they already swooned in April and May, so who knows, maybe they’ll join the June Boom before the month runs out. 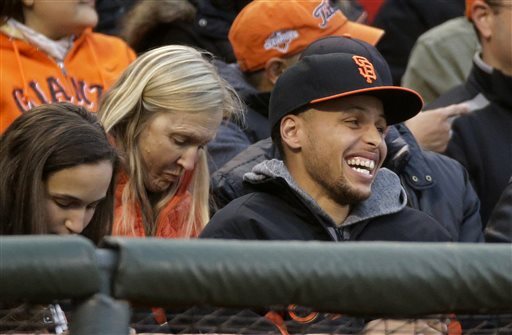 The Giants and Warriors have more in common than just the fact they are playing very meaningful games this month. I see a lot of the 2010 Giants in the Warriors. You’ve got the igniter in young star Stephen Curry for the Warriors, similar to what Buster Posey was to the Giants in 2010. None of the players on either of these teams were even born the last time their franchises won a championship. Another similarity is how fans who largely ignored both teams jumped on the bandwagon as soon as it became evident that those bandwagons were headed for the promised land. I have been a longtime Giants fan through thick, thin, and starvation, but I admit I am among those who have hitched a ride with the Warriors’ this season. But where I differ from those with the brand new Warriors jerseys and caps is that I was there at the start. I was an immediate huge Warriors’ fan as a kid when they arrived in San Francisco from Philadelphia in 1962. I’d read about the exploits of Wilt “The Stilt” Chamberlain in a book I had of great sports moments, and I knew that he once scored 100 points in one game. I couldn’t wait to see him, and never took my eyes off him when I got to go see the team play at the Cow Palace in Daly City. I loved those early Warriors’ teams. Wilt averaged 44.8 points per game that first year, and his supporting cast of nifty guards Guy Rodgers (825 assists) and Al Attles and rugged rebounder Tom Meschery. In the 1963-64 season, the Warriors reached the finals against the legendary Boston Celtics. Say what you want about Lebron James vs. Steph Curry. Chamberlain vs. Celtics center Bill Russell always will be to me the greatest one-on-one matchup in NBA history. The Warriors lost that series, as well as the finals against the Wilt-led 76ers in 1966-77, but they remained a mostly competitive team through 1974-75, when they won the title. But through the years, the Warriors became irrelevant, missing the post season nine consecutive years from 1977/78 to 1985/86, and 12 years from 1994/95 to 2005/06. I drifted away as a fan. Now I’m back, and who wouldn’t be? If the 49ers want their motto to be win with class, they should be watching the Warriors. They earn millions, but they play as if they are trying to survive paycheck to paycheck. Curry seems too good to be true. We have to be careful when we start going overboard about praising an athlete as a person, since we really don’t know them, but Curry seems genuine. He might be the best shooter ever, although I remember watching Lakers’ star Jerry West in his prime. Rick Barry, who led the Warriors to their 1974-75 championship, still might be the greatest San Francisco-Oakland Warrior ever. Barry averaged 25.6 points as a Warrior to Curry’s 20.9, shot 44% in two-point field goals to Curry’s 49%, and made 89% of free throws to Curry’s 90%. The unknown is what Barry might have done if the three-point shot was in effect in his era. Barry scored 64 points in a game in 1974. If the threes were good then, how high might he have gone? ABOUT THAT SWOON: Is the June swoon urban legend? In 57 seasons in San Francisco, the Giants have been under .500 in the month 26 times and over 25 times with six .500 records. Their best June was in the 103-win 1993 season with 19 victories; the worst was 20 losses in the 100-loss 1985 season. The June records in the Giants’ five years they made it to the World Series: 1962, 16-13; 1989, 18-10; 2010, 13-14; 2012, 17-11; 2014, 10-16. Nothing definitive there, so maybe this month just gets bad press because swoon rhymes with June. Maybe if July Oh My or September to Dismember catch on, those months might take on more doomsday significance. LIFE OF RILEY: A national debate broke out over whether Curry should have allowed his precocious and entertaining 2-year-old daughter Riley to take over a post-game news conference. Riley’s actions were a distraction, but I’ve rarely seen athletes provide any revealing tidbits about the game in those interviews anyway. So the question is, should Riley be booted? For the answer, I go to studio head Darryl Zanuck, who faced demands from the cast of “The Sun Also Rises” in 1957 to eject young male star Robert Evans. Replied Zanuck in his famous line: “The kid stays in the picture.” My suggestion: that Curry hire J.T. Snow as Riley’s bodyguard. I could see LeBron fiercely driving for a thundering dunk over Curry just as Riley breaks free and runs onto the court. J.T.’s save of three-year-old batboy Darren Baker, Dusty’s son, from a home plate collision in the 2002 World Series, makes him the best qualified to keep Riley from harm. PRESIDENTIAL VISIT: With their June 4 third ceremonial trip in five years, the Giants have now officially visited the White House more in that period than the Republican leadership. Barack Obama has been the perfect host, since he is a big sports fan. I’ve looked over the list of the potential next occupants of the White House and am concerned. Assuming the Giants continue the trend of odd year crowns, their next scheduled D.C. visit will be June of 2017. There’s not a whole lot of baseball people seeking to be commissioner in chief. The Cub-cap clad Democrat Hillary Clinton threw out the opening day first pitch at Wrigley Field as first lady in 1994, but her team lost the game and a few months later, baseball went on strike and the season was ruined. Not a good sign. Also, beware of a Hillary flip-flop on which team she really supports. As a seven-year-old, she went out on Halloween dressed as Yankees’ great Mickey Mantle. I dunno. Maybe the Giants better win it in this even year, and get Obama one more time before the baseball imposters settle into the Oval Office. YELLOW MELLOW: A USA Today columnist set off a firestorm by ripping Warriors’ fans who feel obliged to don the yellow shirts fixed to their chairs at Oracle. I’m not passionate about this, but I’m leaning in the columnist’s direction. When I go to a game, I wear what I wish. If I want to wear an orange shirt to the Giants game, great. If I choose to wear a green shirt, so be it. The word is fans at Oracle have no choice: they are the enemy if they don’t do the zombie-like thing and don their yellow. This is far different from AT&T, where they hand out rally towels for post-season games, but no one yells at you if you don’t wave it. Giants win on this one. MILD MILESTONES: Unless you’re a Yankees’ fan, Alex Rodriguez’s quest for milestone numbers is a non-event. Arod passed Barry Bonds to be second on the official RBI list behind Hank Aaron, and no one cared. His next target is 3,000 hits. He recently passed Willie Mays for fourth on the all-time home run list. To his credit, he humbly said, in effect, that he is no Willie Mays after that milestone was achieved. Arod’s link to performance-enhancing drugs and his handling of the matter have ruined what otherwise would be a celebration of the great game. Instead, every milestone further tarnishes the sport that has made him so wealthy. He should have quit while he was behind. PIE IN THE FACE: One of the most juvenile moments in baseball is the ritual among many teams where players slam a shaving cream pie or pour chocolate on the game’s hero during the post-game interview. The Giants don’t seem to participate in this silly practice, but as I watched game hero Nori Aoki interviewed recently through his interpreter, I wondered if the interpreter would get the pie too if this was one of those teams. Author Joe Konte celebrates the historic, 100-plus years of the Giants-Dodgers rivalry with a new book, “THE RIVALRY HEARD ’ROUND THE WORLD: The Giants-Dodgers Feud from Coast to Coast.” The book, which is scheduled for release Sept. 3, 2013, focuses heavily on the West Coast rivalry, starting with the arrival of the clubs in San Francisco and Los Angeles in 1958, and ending with an expanded look at the pivotal 2012 season. The book also reports on the East Coast rivalry, starting with the first official game played between the teams in 1889. The book will be available at Amazon.com and at Barnes Noble stores and online sites.